Announcing Our New Patient Portal! Click for more info. Center For New Medicine and Cancer Center For Healing were created to empower, provide the most technologically advanced treatments and care, while educating individuals and their families to help them achieve their maximum lifespan, with the highest quality of health throughout, feeling great, looking great, with high energy and high spirits. We believe in early cancer prevention. Cancer cells can be detected before symptoms appear and in early stages of development with a simple blood test, which can detect proteins and/or other substances made by the cancer in your blood. Center For New Medicine offers a vast array of services for men, women and children, including the latest in cancer therapies, addiction therapies, detoxification, holistic dentistry, nutrition, fitness and weight loss, cosmetic/laser treatment, pain management, allergy therapy, acupuncture, massage therapy, hyperbaric oxygen therapy, and much more. 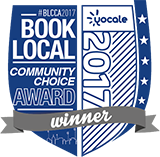 The Book Local Community Choice Award is an independent annual review conducted by Yocale to identify top industry leaders in communities across the country who continuously provide exceptional customer service on a regular basis. The winners receiving this award were chosen based on a number of factors including various review based sources. As featured in Huffington Post. Dr. Connealy attended the University of Texas School of Public Health, and then attended the University of Health Sciences Chicago Medical School. She completed her post-graduate training at the Harbor/UCLA Medical Center in Los Angeles, CA. We are open Monday through Friday, 8:30 AM to 5:00 PM. Give us a call or send us an email to schedule a personal consultation with an Integrative Specialist. Don’t Let Halloween Special Effects Become After Effects!